Upon arrival at the auction on sale day, please read the Terms and Conditions.For your convenience we have printed the Terms and Conditions on our on signage throughout the sales arena and on the back of your yellow bidder’s number card which will be provided to you when you register as a bidder. Please ask the auction staff for clarification prior to bidding. A non-refundable deposit of $500 or 10% (whichever is greater) is required once you are the successful bidder on a vehicle. Deposits may be paid by cash, debit, MasterCard or Visa. The outstanding balance of your purchase is required by noon on the Tuesday following the auction. Acceptable forms of payment are cash, debit card, bank draft or certified cheque, MasterCard or Visa. Additional administration fees may apply to credit card transactions. Please note all vehicle purchases include the purchase price plus the Buyers’ Fees. GST, PST is extra. Please ensure you factor these costs in when making your bid in the auction ring. Once the auctioneer announces sold, and you are the successful bidder, you are required to pay for the item. 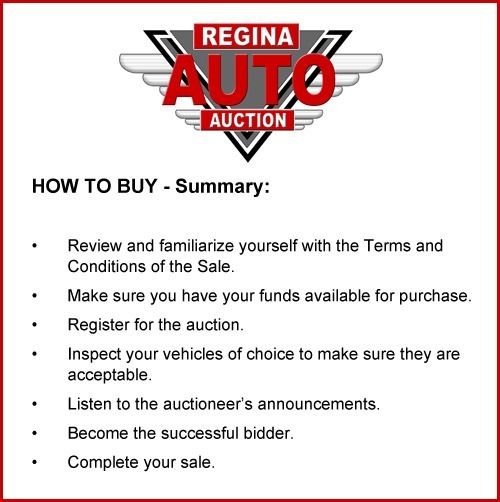 It’s free to register at Regina Auto Auction. You will be required to provide a valid driver’s license to obtain your bidder registration. You will then be assigned a bidding number. Protect this bid card as you are responsible for all purchases made under this number. You are now ready to buy. Take the time to visually inspect the vehicles in the yard prior to the auction sale. Check the equipment on a vehicle to ensure that it fits your requirements. Keep in mind the age, insurance costs and costs of reconditioning. Factor this into your purchase price. Remember, all used vehicles require some reconditioning. If you are not mechanically inclined bring a friend who may be of assistance to you. If it is your first time to attend an auction sale we recommend that it is best to watch and listen as the pace moves quickly. At Regina Auto Auction we are here to help. Ask questions before you bid. Listen carefully to the auctioneer when he makes announcements about the vehicles. These announcements are for your benefit so you have as much information as possible about the condition of the vehicle in the ring. Please refrain from bidding on a vehicle that you have not inspected, or if you haven’t been present for the auctioneer’s announcements for that vehicle.